--“‘While it is vital for the president to have clear authority to respond to nuclear attacks on the United States, our forces or our allies, no president should have the authority to launch a nuclear first strike without congressional approval,’ Markey said at a press conference alongside 28 file boxes filled with petitions. ‘Such a strike would be immoral, it would be disproportionate and it would expose the United States to the threat of devastating nuclear retaliation.’ Markey called the act ‘absolutely critical during the Trump administration,’ pointing to his rhetoric toward North Korea and Russia. He added that the signatures on the petition ‘are a reflection of concern across our country of the use of nuclear weapons by the president.’” Full article here. See also - WATCH Sen. Markey Rep. Lieu and others deliver half a million petitions backing the Restricting First Use of Nuclear Weapons Act here. --“‘No human being should have the sole authority to initiate an unprovoked nuclear war,’ Markey continued. ‘Not any American president, and certainly not President Donald Trump. As long as that power exists, it must be put in check.’ Democratic Congressman Ted Lieu, of California, who introduced a companion measure in the U.S. House, meanwhile, said ‘it's destabilizing if countries know we can do a first use on nuclear weapons.’” For the full article, click here. Take action - Ready to restore checks and balances to the nuclear codes? 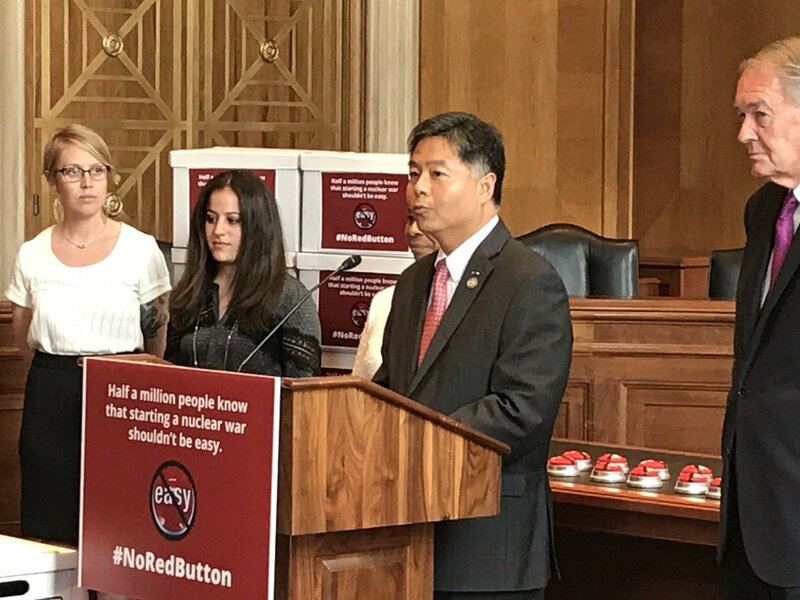 Inspired by the legislation proposed by Rep. Ted Lieu and Sen. Ed Markey, Ploughshares Fund, along with sixteen other public interest groups, has created a new petition urging Congress to keep America safe by preventing any U.S. President from unilaterally launching a nuclear weapon. Sign and share the petition today. Stephen King condemns Trump - “Author Stephen King slammed President Trump on Wednesday, saying Trump’s tweets show that ‘he’s an almost textbook case of personality disorder,’” writes Brandon Carter for The Hill. “King also signaled fear over Trump’s ability to launch a nuclear attack. ‘That this guy has his finger on the nuclear trigger is worse than any horror story I ever wrote,’ King said… King’s comments come as lawmakers are pushing a bill that would deny Trump the authority to launch a first strike with a nuclear weapon without Congressional approval.” Article here. See also - Joe Cirincione interviewed this morning on The Bill Press Show here. --“Their aims include offering public and private advice in real time to Trump’s team and leaders of other governments in the hope their collective credentials will make officials listen — and take concrete steps to avoid escalation and make a nuclear exchange, whether accidental or on purpose, less likely… ‘We need savvy, independent, experienced experts to shine a spotlight on these dangers, speak truth to power, and make sure these flash points aren't catastrophically mishandled,’ [Global Zero executive director Derek] Johnson said. ‘It's our goal to help to chart a course safely through to the other side. Part of that too is exposing these risks — focusing the press and the public on these dangers so governments can't ignore them or blunder into disaster — and ratcheting up pressure for diplomatic solutions.’ Warned [Chief START negotiator Amb. Richard] Burt: ‘We are much closer into coming into conflict.’” Full article here. --“Russian and regime forces continue to carry out air strikes on innocent civilians, focusing their latest air strikes on three hospitals in northern Syria on April 27, 2017. In April alone, Russian and regime-led airstrikes killed 543 civilians. ‘The U.S. missile strikes might conceivably deter further chemical weapons attacks,’ warns Aditi Gorur, Director of the Protecting Civilians in Conflict Program at the Stimson Center, ‘but conventional attacks on civilians will continue, backed by Russia.’ The greatest danger is that Trump has learned the wrong lesson from this moment of glory (and the dropping of the MOAB in Afghanistan) and now believes that bold military strikes—or the threat to do so—will cause North Korea or Iran to cave to U.S. demands.” For the full article, click here. Listen - Ploughshares President talks nukes: “How do we deal with North Korea, Iran, Russia, and Trump?” with Terrance McNally for Free Forum here. --However China continued to urge talks with North Korea, remarking: “‘In order to ease the tension over the Korean Peninsula and pull relevant parties back to the negotiating table at an early date, China has put forward the dual-track approach and suspension for suspension proposal,’ said Beijing’s envoy, Fu Cong. China’s proposal would try to kick start talks concurrently with pausing further North Korean nuclear developments and international economic sanctions.” Full article here. See also - “North Korean Media, in Rare Critique of China, Says Nuclear Program Will Continue” by Choe Sang-Hun for The New York Times here. --“Air Force Global Strike Command said data collected from test launches are used for ‘continuing force development evaluation.’” Test launches demonstrate the capability of the Minuteman missile system as well as ensure “‘the United States’ ability to maintain a strong, credible nuclear deterrent as a key element of U.S. national security and the security of U.S. allies and partners,’ the strike command said.” For the full article, click here. See also - “New Developments in North Korea’s Ballistic Missile Infrastructure—What Does it Mean for the Future?” by Joseph S. Bermudez Jr. for 38North here. --“Forget North Korea. The Next Nuclear Crisis Festers On The India-Pakistan Border” by David Wood for the Huffington Post here. --“North Korea tests missiles designed to defeat U.S. THAAD defense system” by Rowan Scarborough for The Washington Times here. --“Can President Trump Cut a Deal for Peace on the Korean Peninsula?” by Douglas Macgregor for The National Interest here. --“Appropriators cut $20M from B-21 program in omnibus spending bill” by Valerie Insinna for DefenseNews here. --“Nurturing People-to-People Ties with Iran” hosted by Atlantic Council. Friday May 5, 2017, 10:00a.m. Atlantic Council, 1030 15th ST NW, 12th Floor, Washington, D.C. 20036. Details here. --“Reducing the Threat of Nuclear War.” Featuring: Joe Cirincione, William Hartung, Elaine Scarry, and others. Massachusetts Peace Action. Massachusetts Institute of Technology. Saturday May 6, 2017, 9:00a.m.-5:00p.m. MIT Room 34-101, 50 Vassar St, Cambridge, MA 02139. Details here. --“21st Century Nuclear Disarmament: Lessons from the Past and Present, Visions of the Future” John Carl Baker, Mellon-ACLS Public Fellow at the Ploughshares Fund will be speaking. Monday May 8, 2017, 12:30 p.m. Princeton University, 221 Nassau Street, 2nd Floor, Princeton, NJ, 08542. Details here. --“Evaluating the Iran Deal” Featuring Ambassador Wendy Sherman, Senior Counselor, Albright Stonebridge Group; Laura Rozen, Diplomatic Correspondent, Al-Monitor; moderated by Benjamin H. Friedman, Research Fellow, Cato Institute. Tuesday May 16, 2017, 10:00a.m.-11:30a.m. Hayek Auditorium, Cato Institute, 1000 Massachusetts Ave NW, Washington, DC 20001. Details here. --“Strategic Competition in Southern Asia: Arms Racing or Modernization?” Wednesday May 17, 2017. 10:00a.m.-1:45p.m. Stimson Center, 1211 Connecticut Ave. NW, 8th Floor, Washington D.C. 20036. Details and RSVP here. --“Debate: Modernization of Nuclear Missiles.” Hosted by Project on Nuclear Issues (PONI) and Ploughshares Fund. Featuring: Jon Wolfsthal, Christine Parthemore, General C. Robert Kehler (Ret.) and Heather Williams. Tuesday May 23, 2017, 4:30p.m.-7:00p.m. at CSIS Headquarters 1616 Rhode Island Ave NW, Washington, DC 20036. Details here. --“The Women’s March to Ban the Bomb.” Women’s International League for Peace and Freedom. Saturday, June 17, 2017, 12:00p.m.-4:00p.m. Dag Hammarskjold Plaza, Greenmarket, 2nd Avenue, New York, NY 10017. Details here. --“PONI 2017 Summer Conference.” The first conference of the 2017-2018 PONI Conference Series will be held June 21-22 at Lawrence Livermore National Laboratory, Center for Global Security Research in Livermore, California. The two-day conference will feature a series presentations from emerging nuclear experts, a keynote address, tours of facilities at Lawrence Livermore, and a breakout discussion on nuclear terrorism adapted from a ministerial-level scenario that will led by Corey Hinderstein and Heather Looney from NNSA. The conference will be off-the-record. Details here.